I know that for some $\beta$ (close to 0.6), the quartic polynomial has exactly 2 positive roots. I'd like to find such a value of beta. You can brute force this using a method inspired by binary search. So as @Mariusz Iwaniuk said in the comments, you're looking for a number in the ballpark of $0.607052331679449$. Note that my implementation isn't very general and relies on your specific FF being the format it is. No doubt it could be generalized to fit a broader scope of function definitions, though. There may be a more elegant math-y way to solve it, but I just resort to computational/numerical methods above. 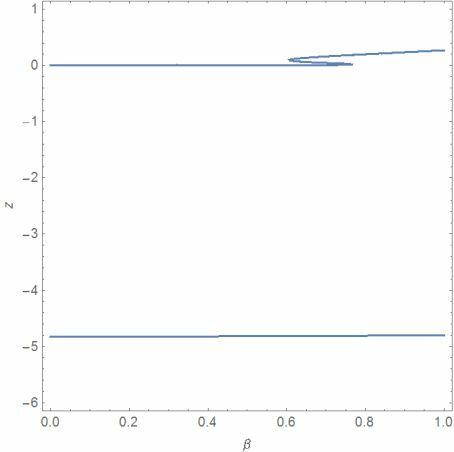 There is no region in the positive parameter space for which there are exactly two positive roots. We can show this as follows. 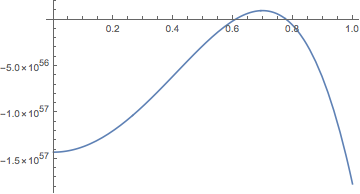 First note that the number of positive roots can only change by a root crossing the axis or by two roots joining (a multiple roots) and becoming complex valued as the parameter changes. The first case is accounted for by solving for the parameter when z is zero. The second arises at roots of the discriminant polynomial. All we need to do is find all these relative change points, and count positive roots at the centers of the intervals between them (since the number of positive roots is constant in these intervals). 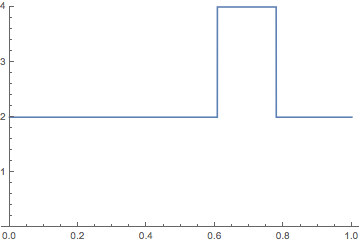 We see that no interval has exactly two positive roots (between 0.607052 and 0.779012 there are three positive roots). If you ignore multiplicity, there are exactly two at the endpoints of that particular interval. Let's try a more algebraic solution! First we Rationalize the polynomial so we can work symbolically until the end and be sure we get maximum precision. In case you have symbolic expressions for your polynomial coefficients you can insert those instead and solve the problem fully analytically right until you want the decimal representation of the solution. Here we cleaned up a bit by throwing away the denominator because it doesn't affect the roots. Here we can see we are interested in the change around 0.6 when the number of real roots changes from two to four. We shouldn't use this form directly though since the Im[#]==0 part is numerically unstable and therefore not reliable for a solution. which looks exactly like what we want. So now the only thing left to do is to get the root of the discriminant close to 0.6 and we are done! You could use ContourPlot to get an overview. The solutionplot shows two ranges β < 0.6 and β > 0.78 with only two solutions! Not the answer you're looking for? Browse other questions tagged mathematical-optimization polynomials or ask your own question. Find roots of polynomial in field extension $GF(2^n)$? Get the first positive coefficient in polynomial? How to find zeros of 16th degree polynomial with coefficients which contain one symbolic parameter? How do I find the analytical roots of this polynomial?